The Wicker Park Bucktown Chamber of Commerce appealed to Firebelly to design a provocative and compelling campaign that would bring visitors and shoppers to the area. Our ads appeared prominently in transit advertisements as well as local magazines, such as Time Out Chicago. Each of the 33 ads featured “Three Random Things” that highlighted businesses and the assortment of goods one could find in the neighborhood. The "We Got It in WPB" campaign appeared in local print media including Time Out Chicago. Our intent for these ads was to first draw your eye to the visuals, and then to encourage you to question why these three particular items were grouped together. Thirty-three different ads were created for the campaign. Collectively, they promoted almost 100 small businesses. To gain community participation, we created a website where people could suggest their three favorite local things for a chance to be included in the campaign. The website was also available on mobile devices. At the height of the recession in 2009, the Chicago neighborhoods of Wicker Park and Bucktown wanted to attract new visitors. The local chamber of commerce was looking for a way—on a minimal budget—to create a high-impact print and digital campaign to encourage shopping locally and to gain community involvement. The “We Got It in WPB” campaign featured playful typography and vivid graphics that represented nearly 100 businesses in Chicago’s Wicker Park and Bucktown neighborhoods. The print ads which appeared throughout the Chicago Transit Authority and in local publications required viewers to take a closer look at the graphics to get the full message. The whimsical ads helped relay where in the neighborhood these wide array of items could be found. $80,000 total budget for campaign design and media buys. The client was a nonprofit; however, because we work with nonprofits on a regular basis, it is our policy not to give discounts. Instead, we find ways to work within the budget the clients have (or we pass on the project if it is just not feasible for us). To start this project, we did an assessment of the two neighborhoods. We walked up and down every major street, counting vacancies and recording as much information about the buildings as possible (taking photos, identifying owners and collecting contact information, etc.). We then created a database of all available storefronts. While this database was a requirement the Chamber of Commerce needed to fulfill their funding, it was a great exercise for us to begin getting a handle on what was occurring in the neighborhood. We gained an understanding of what sections of Wicker Park and Bucktown were most in need. After we finished our initial assessment, we walked the streets and spoke with business owners, residents and people who were shopping and hanging out in the communities. We had a unique set of questions depending on whom we encountered to help us get a perspective on their views of the neighborhoods. Additionally, we spent a great deal of time taking pictures to document the area. Our research revealed a very mixed view of the two neighborhoods. This was due in part to the fact that, over the previous five years, more and more chain stores and national banks had moved into the area. Another factor that skewed people’s opinion of the area was gentrification from the housing boom. Given that these factors led to some negative feelings, we knew the campaign had to be prepared for the possibility of backlash. Our strategy began with brainstorming possible campaign directions that would support the greatest possible number of small businesses while also making sure that we were conscious of audience perception. Ultimately, we decided on a direction we called “Three Random Things” to showcase the uniqueness in the communities. The overall concept was to pick three small businesses—each with an item that you wouldn’t be able to find anywhere else in the city. Each advertisement would feature three of these items prominently with photos and typography. 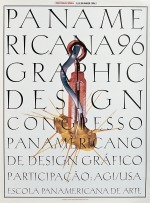 The design concept was to create a consistent visual language throughout the 33 different ads that uniquely presented these chosen “things” in a visually provocative way. By marrying bold type with photography, we put each business on the same level playing field—regardless of whether they were a corner taco stand or the trendy designer toyshop. When possible, we photographed each of the items for inclusion in the ads and only used stock imagery when absolutely necessary. Our intention was first to draw one’s eye to the visuals, then to prompt one to question why the three items were grouped together, and finally, to pique one’s curiosity enough that they wanted to find out where the featured items could be found (only in Wicker Park Bucktown). We created 33 different ads, each showcasing three different businesses, which allowed us to promote almost 100 small businesses, both in print and online. Print ads appeared throughout the Chicago Transit Authority in trains and on buses as well as in local publications like Time Out Chicago. Additionally, we sought community participation by creating a website where people could suggest their three favorite local things for a chance to be included in the campaign. As with most advertising, it’s a challenge to be certain if your campaign will be successful. Since our method featured so many different types of businesses, it made it even more difficult to sense what kind of impact this approach might have. Additionally, our media budget ended up costing approximately $45,000 for a three-month campaign, which had to be stretched to the max in order to be most effective. While it was challenging to get actual numbers, it was clear to us—as well as our client—that the campaign was ultimately a success simply because none of the 100 businesses featured in the campaign closed. Many of the business owners we talked with during our research phase shared that they had been very close to closing their doors due to poor sales. In addition, we had several events throughout the campaign to bring the businesses together. This ultimately created a more tight-knit community and even resulted in a peer mentor group. Following the campaign, the client used our research on the available storefronts and hired us to create a follow-up campaign that focused on renting properties in particularly inactive segments of these neighborhoods.